The award-winning Duo Race Aero ranks near the top of the technology podium and skis surprisingly well for its ultralight weight. Used by many randonee racers and ski mountaineers in Europe, the Duo Race is designed by Ski Trab using techniques and materials borrowed from the aerospace industry. With an Aramid honeycomb core that is found only in top end Ski Trab skis, the Race Aero is reinforced with carbon fiber and finished with radial edges and a sintered base to make an extremely competitive race ski that is durable enough for touring. Quadriaxial cap construction makes for a stiff and sturdy right at an incredible weight of only 840 grams (1lb 13.6oz). Honeycomb core uses a nearly hollow beehive-like pattern of Aramid that boasts the best strength-to-weight ratio in the ski industry. 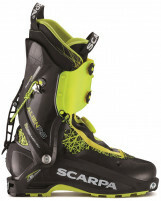 Separate flex patterns in the tip, tail, and midsection were designed to be nimble in all snow conditions. Carbon fiber reinforcements provide torsional stability without the weight, and similar binding inserts ensure you're held to the ski. 52HRC hardened steel edges offer enough durability to make this an everyday light-and-fast touring ski. Edge radial finishing ensures you get a grip in icy couloirs, while the graphite-sintered base helps you glide smoothly. The Duo Race Aero is manufactured with a similar process as the amazing Race Aero World Cup, with a few cost saving measures along the way that lower the price by $500. The Duo Race lacks the High Modulus carbon cage (Hibox) that wraps the WC version and allows the pricier ski to use a weight saving differentiated core. Coupled with a 5mm wider tip, the Duo Race Aero weighs in at 145 grams (5.1 ounces) more per ski than the World Cup [164cm]. Bottom Line Highly bearable lightness with touring durability.